Convenient, lightweight and portable 4" x 1" Diamond Whetstone™ sharpener works well on scissors, knives, garden tools, and specialty tools. The added milled groove allows you to sharpen hooks as well. Convenient size measures 9 1/2" long open and 5" long when closed. 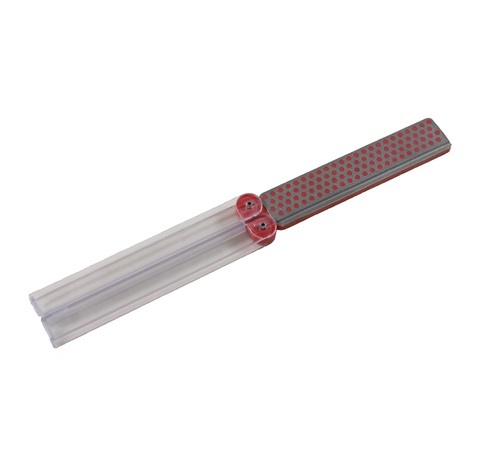 Folding plastic handles protect sharpener when not in use. Sharpens in a fraction of the time required by conventional stones. No messy oils needed -- sharpen dry or with water. Durable construction will provide years of consistent performance and reliable service.